Karen here and today I wanted to show you a quick and easy way to make a tutu for your doll using duct tape and tulle. Step 1- Assemble your supplies. Open your duct tape roll. Step 3- Measure and tear a strip of duct tape from the roll at 12 inches. Lay it flat on your surface. Step 4- Measure and unroll 35 inches of tulle from your roll and cut. Step 5- Fold your tulle over at 2 inches this will give your tulle more volume when you attach it to the tape. 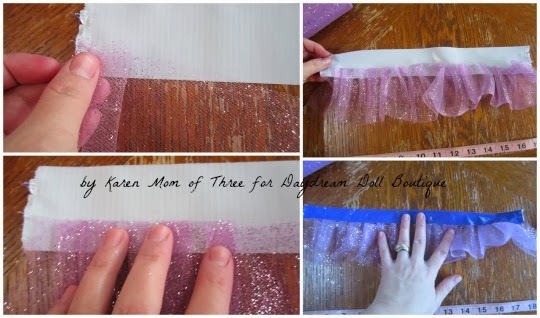 Step 5- Press one end of the folded tulle at the edge of the tape and fold and gather it with your finger as you go all the way to the end of the tape. Step 6- Fold over the top edge of the duct tape and press along the gathers. 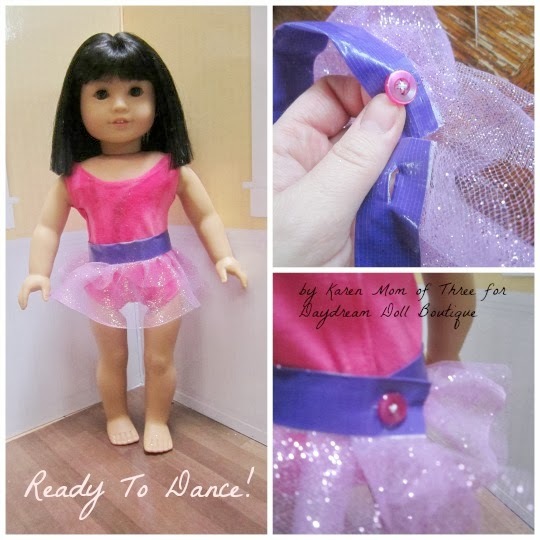 Step 7- Thread your needle and knot the ends. Select your button. 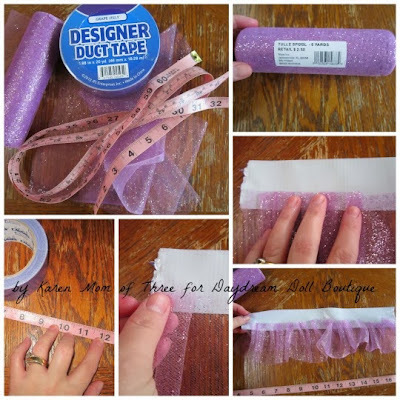 On one end of your tape band about 1/2 inch in from the end, sew on your button. Step 8- On the opposite side use a stitch ripper to make a button hole 1/2 inch from the other end of your tape band, make your slit going away from the edge of your tape band, make it the width of the button. 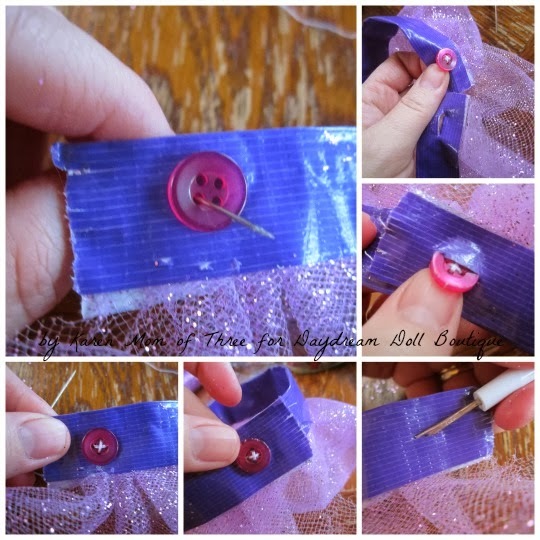 Step 9- Try out your button hole. Make sure the button slides through the button hole. 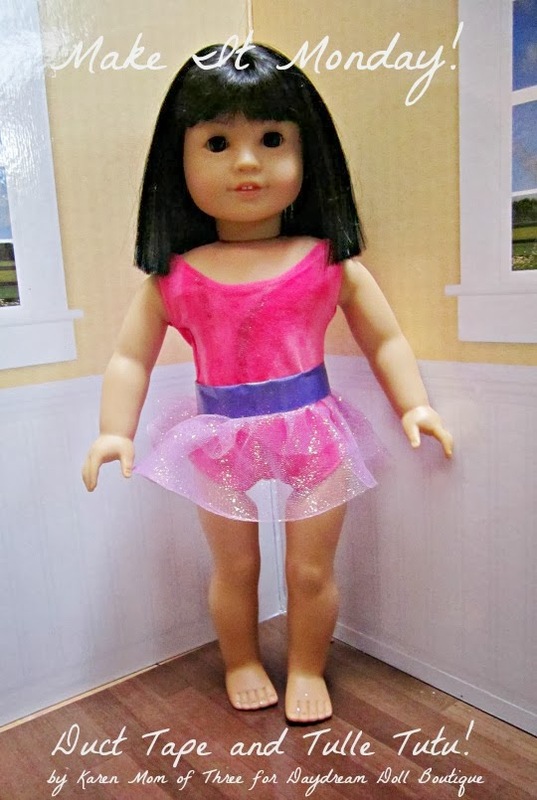 Step 10- try your tutu on your doll and you are ready to dance!